Are you looking for a central spot to explore the wonders of water, wildlife, people and beaches - from white water rafting to active volcanos and rain forest canopy tours? You've found it at Condominium Mana! 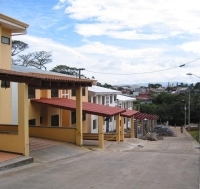 The 2-bedroom condo is located less than a 10-minute drive from the main Costa Rica airport, Juan Santamaria International Airport. Direct flights are offered there by a number of North American airlines mainly from Toronto, Miami or Houston. If you're looking for flights, the airport code is SJO, standing for San Jose, CR. If you're inexperienced in Internet bookings, be careful you don't mix up San Jose, CA, with San Jose, CR - CA stands for California, whereas CR stands for Costa Rica. If you want a rental car, you can easily pick it up on your way. "We encourage you to explore this site and all the links we have provided to give an overview of the spectacular surroundings. Please contact us at any time to find out more about Condominium Mana." Copyright © 2008 Condo Mana. All Rights Reserved.